This version of Fallout's new post-apocalyptic universe-based RPG, FALLOUT 76, is for Xbox One and is scheduled for release on November 14, 2018. Attention: Buyers of the Xbox One version of Fallout 76 will have access to the Beta with the game reserve, although the date of access to the Betas is not yet known. Don't forget that this product can come in several versions: In physical version, so you will receive at home the box with the product, like any other purchase. or the digital version. 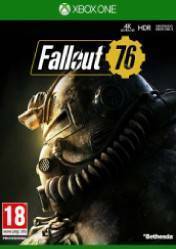 This latest version can be in account format or in code format, which you will need to enter into your Micrsoft account to download Fallout 76 for Xbox One.